The S&P 500 Index rose 0.1 percent to 1,972 at 10:30 a.m. in New York, after rising as much as 0.5 percent earlier. (Bloomberg) — U.S. stocks fluctuated after a rally sparked by better-than-forecast economic growth faded before a Federal Reserve decision on monetary policy. Twitter Inc. soared 19 percent as results beat estimates and the company boosted its annual sales projection. Amgen Inc. rallied 5.5 percent after raising its profit estimate and announcing job cuts. Hess Corp. gained 3.4 percent as the company said it will form a master limited partnership for one of its units. The Standard & Poor’s 500 Index rose 0.1 percent to 1,972 at 10:30 a.m. in New York, after rising as much as 0.5 percent earlier. 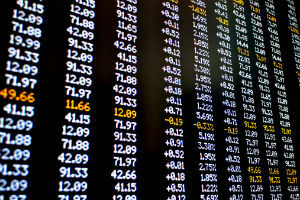 The Dow Jones Industrial Average lost 12.64 points, or 0.1 percent, to 16,899.47. The Nasdaq 100 Index increased 0.5 percent. Stocks rallied earlier as gains in consumer spending and business investment helped the U.S. economy rebound in the second quarter following a slump in the prior three months that was smaller than previously estimated. Gross domestic product rose at a 4 percent annualized rate after shrinking 2.1 percent from January through March, Commerce Department figures showed today in Washington. The median forecast of 80 economists surveyed by Bloomberg called for a 3 percent advance. The S&P 500 fell 0.5 percent yesterday as President Barack Obama announced new sanctions against Russia. The equity gauge has advanced about 7 percent this year as the U.S. economy shows signs of recovering from the contraction in the first quarter. Fed Chair Janet Yellen said earlier this month that the central bank must press on with stimulus with record easing to combat persistent weakness in the job market. A report today from the ADP Research Institute showed companies in the U.S. added 218,000 workers to their payrolls in July, below economists’ forecast for a 230,000 advance. The private payrolls report comes before Friday’s data from the U.S. government that may show the addition of 231,000 non-farm employees in July, according to the median estimate. Three rounds of monetary stimulus from the Fed have helped fuel a five-year bull market as the S&P 500 almost tripled from 2009. The benchmark gauge has gone without a 10 percent correction since 2011. Equity markets will see a decline at some point after surging for the past several years, according to former Federal Reserve Chairman Alan Greenspan. Pacific Investment Management Co.’s Bill Gross said investors should say “good evening” to the prospect of future capital gains in asset markets as interest rates are set to rise while the economy grows at a slow pace. Kraft Foods Group Inc., MetLife Inc. and Whole Foods Market Inc. are among 36 S&P 500 companies reporting earnings today. About 77 percent of those that have posted results this season have beaten analysts’ estimates for profit, while 67 percent exceeded sales projections, data compiled by Bloomberg show. Profits probably rose 8.2 percent in the second quarter, while sales gained 3.5 percent, according to analyst estimates compiled by Bloomberg. –With assistance from Sofia Horta e Costa in London and Jacob Barach in New York.